Copyright © 2007 SVJ Designs, LLC. According to a post on the theater's Facebook page on September 15, 2017, UltraScreen #2 now has heated DreamLounger seating. The sconces have been removed as well, which may help with ambient light issues that have been plaguing the shiny reflective 3D-friendly screens. Seating in #2 was reduced from 478 (362 plus 116 VIP) to 293 as a result of the changes. UltraScreen #1 was closed for renovations (presumably for the seating and lighting, etc.) as of the 15th. The UltraScreen represents the best that Marcus offers at the Majestic location. The fact that it doesn't have the reclining seats offered in the DLX auditoriums in your other locations doesn't matter much to me, as I've never had an issue with the seats in the UltraScreens there. What I do expect for my UltraScreen ticket price is an excellent presentation, and our recent experience of seeing Rogue One (2D) was anything but. Most egregious is the lacking picture quality. The house lights were not dimmed far enough to keep the silver screen from turning the blackness of space into a muddy gray. (I really wish that one of the UltraScreens didn't have the 3D-friendly silver screen, so we could get black levels that are better than $200 flat panel TVs at Target.) The upper doors were not closed completely, which probably didn't help any. In addition, there was a red glow on the bottom corners of the screen, presumably from the lower tunnels. I don't know if those doors were closed or not. A smaller nitpick is that the upper right corner of the screen appeared to have a fuzzy corner, almost as if something on the port glass was showing up on the screen. If I wasn't in the middle of the row, I would have gotten up and complained, but I didn't want to miss any of the movie I just paid for, and inconvenience everyone between me and the aisle in the process. The Atmos sound was good, but not excellent. It was difficult to discern whether the overheads were operating, as even during the Dolby Atmos snipe before the show, the overhead effect wasn't exemplary. That's not worth complaining much about (given the other, more serious issues), but this theater continues to lack low-end bass compared to other theaters I've attended. I don't want crappy-car thumping bass, but I do expect the bass to kick in when an entire city explodes after an assault from the almighty Death Star. If this is the best your flagship theater can do, that's unfortunate. If you have it turned down intentionally because of complaints, then I'd recommend getting a sound tech in to diagnose your system, because a theater with proper dynamic sound range shouldn't be painful for people. If the lights are kept high and the sound is kept low because of concerns about patrons falling or not liking loud sounds, I suggest creating a special showing in a smaller auditorium that raises the lights and lowers the sound so it's more like their living rooms at home. Maybe you could call it "soundbar cinema" or something like that? I did raise my concerns to a manager on the floor after the show and he did seem concerned and offered me and my family passes. I'm not sure that anything was done, or if I was just dismissed as an outside-of-average cranky customer to be assuaged with passes. When I attend a movie theater and pay a premium price, I want to have the best presentation possible. I drove past the Ridge Cinema to go to Majestic so that I could enjoy Rogue One as best possible, but now I wonder if I wouldn't have been better off saving the gas and time. As long as I avoid some of the unacceptable screens at Ridge, their shows are usually acceptable (kind of like how fast-food places serve usually acceptable food). But I didn't go to Ridge, and I didn't pay less money. I traveled further and paid more money, and the UltraScreen disappointed. That's why I can't give you any better of a ranking than a "6". If I hadn't been able to find a manager, or if he had given me the impression that he didn't care, I would have given an even lower score. I'm looking forward to seeing Rogue One again at Mayfair's IMAX screen to compare. I wish that it wasn't in 3D, it will be interesting to see how the presentation compares to the UltraScreen. I don't want to sound as though I'm just complaining. You asked me to take this survey, so I'm hoping that you take this opportunity to examine whether there is anything that could and should be improved at the Majestic location. I'm not looking for free passes, I'm looking for the best possible presentation. Please make the presentations at your UltraScreens reflect the premium price that you charge and make them deserve the prominence your marketing advertises. I am very happy to recommend excellent presentations! 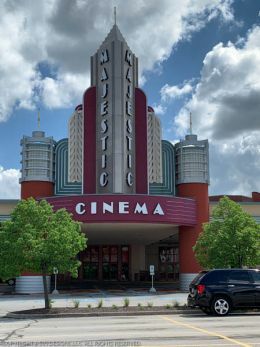 Coming soon your moviegoing experience will be even more convenient with reserved seating in all auditoriums at the Majestic! This always was my Preferred theater, however, the last few times I've had problems parking. I'm handicapped and can't wait far. The theater needs more parking for disabled people. I arrive as early as an hour before and still can't park. I'll be trying another theater from now on. We attended the 7pm show of Star Wars: The Force Awakens on Jan 9, 2016 in UltraScreen #2. The movie began at 7:14pm, so a little earlier than it usually does, so either the pre-show ads got started early, or they have reduced the amount of advertising preceding their movies. I believe that this is the first time that I've been in this auditorium since they upgraded to a Dolby Atmos sound system. Two columns of seven overhead speakers were spaced out approximately 32' apart column-to-column and about 12' apart front-to-back. Seven speakers were located on each side wall, and six on the back. The sound was good, but not excellent, as I felt as though this auditorium still suffers from a lack of good, low, gut-thumping bass. I watched the same movie at a different theater (AMC Prime in Vernon Hills, IL) on 12/30, and there was much more on the bottom end. When spaceships roar past the screen, and when Kylo Ren uses the force to interrogate a prisoner, there should be a lot of low-frequency sound, and this theater did not reproduce that effect, which diminished the impact of those scenes. Picture quality was acceptable, but given that this was a movie in space, you would like to see space be black instead of grey. Marcus tends to keep their lights up higher than other theaters, and the highly reflective screen that was installed years ago to make 3D movies brighter makes everything a little washed out. This isn't as noticeable in brighter scenes, but dark scenes are not what they should be. This UltraScreen does not have the Marcus Dreamloungers, which is OK with me. I've never had a problem with these seats, and the Dreamloungers cut the seat count so low that it's difficult to get a decent seat for popular movies. Overall, however, this experience proves that the UltraScreens are the best way to see a movie in a Marcus theater. It's worth the upcharge so that one doesn't have to play the lottery and hope that you don't end up in a substandard auditorium. While it doesn't hold up as well when compared to other theaters in the Chicago area, most people would rather not drive an hour to see a movie. Any chance the Majestic could get a hold of a copy of the movie ROAR (1981) and show it? I've always been fascinated by the true story behind the film and just read that there is a limited release happening across the country. However according to the press release the closest to us is a showing in Chicago. Are you going to let them have an exclusive over us??? I am a senior citizen, I find that you have very reasonable prices for seniors on certain days, which makes it very senior friendly. My friends and I attend often. The theater is always very clean and comfortable. I like that the staff is always courteous and is not afraid to give a smile, it means a lot to seniors that they are not treated as second class customers. the theater itself is great we attended quite often and it is our favorite theater however i am handicapped and they do have have seats marked handicapped but they do not watch to see if capable people are using them. maybe they have to do a better job of marking these seats handicapped only and ask the patrons sitting there if they are truly handicapped. also they do have quite a few handicapped parking spaces but could surely use more as the general population is aging. Movie & date: Been going to 99% of the time to the Ultra Screens...all different dates & times ever since they opened for one of their openings!! I am extremely disappointed that it is impossible to speak with a human being here! Why? "On 7/12/13 we seen Heat"
Attended the 7pm show of Iron Man 3 on 5/15/2013 in UltraScreen 2. Movie started at 7:17pm. When seeing blockbuster movies, I usually seek out the UltraScreen at the Majestic, as it's probably the best presentation available in Milwaukee (not perfect, but probably still the best). Some movies call out for big and loud and Iron Man 3 is just that kind of movie. Because the Majestic offers upgraded food selections at the concession stand, and my past experience has been pretty good with them, I skipped eating beforehand so I could sample something new of their menu. This time, I chose the chicken sandwich for $8.95. Like the other items I've had, it was pretty good, even though it should be for almost $9 for a sandwich and fries. An unpleasant surprise was that they've increased their concession prices again. I don't recall if the sandwiches are more expensive than in the past, but they seem to be. A junior soda, which is probably 16 ounces, cost $4.25. That comes to $27.50 per gallon! All that aside, the presentation once the movie started was acceptable. The blue haze present on the bottom of the screen during the pre-show thankfully disappeared once they switched to the previews. The picture quality was pretty good, but not as sharp as it should have been given that it's projected digitally. This seems to be a characteristic of the UltraScreen though, and it's not bad enough to avoid; mainly because focus and sharpness has always been a problem for theaters in Milwaukee. While the sound quality did not exhibit any problems, I would have liked a little more bass. This was an action movie afterall, and there were plenty of opportunity for the floor to shake, and I didn't get that feeling at all. Sub-bass can rattle your insides, like the bass drum in a parade, and there wasn't that level of sound performance present in what will arguably be the biggest action movie release of the summer. Too expensive. Lack of attendance should be the indicator. I only go here to meet friends who seem to forget the expense until they pull out the wallet. I'm always trying to get them to go some place else. Meeting a friend who is visiting someone at Waukesha Memorial Hospital tonight. Attended the 11:30am show of Harry Potter and the Deathly Hallows Part 2 (2D) on July 28, 2011 in UltraScreen #2. This was a film-based presentation (not digital cinema). After the lackluster presentation of Super 8 in UltraScreen #1 in June, I was hesitant to return to see the last Harry Potter movie. I knew it was going to be a darkly lit movie, and I felt that the dingy greys and stair light reflections would really affect my enjoyment of the movie. After being assured by the staff that UltraScreen #2 did not have the silver screen that is needed for 3D in UltraScreen #1, I then felt a sense of curiosity to find out if the experience in #2 would be better. I am very happy to report that both the picture and the sound in UltraScreen #2 were very good! While the house lights were still a little high for my taste (especially the exit signs and downlighting over the upper exits), the screen did not wash out as much as it did in the other UltraScreen. We sat about three rows from the back of the general seating, in the center, and I think moving down a couple of rows would have helped to not see the exit lighting as much without getting too low in respect to the screen. I was very glad to notice that the stair lights did not reflect off the screen, which was much more annoying than a general loss of black level. Theaters are forced to keep their ambient light at a certain level so that people don't fall in the darkness, so I get that, but then I expect the theater to do everything in their power to keep that light from affecting the image any more than necessary. I'm hoping that someone from Marcus will see these comments and check out the two UltraScreens for themselves. If they aren't going to rip out that awful silver screen in #1, then at least they could do something to keep the stair lights from acting like flashlights on the screen. Until they do, I will avoid seeing any more movies in UltraScreen #1. Harry Potter had a better soundtrack than Super 8, and the sound system was able to keep up and it even produced that low-end rumble in your gut that it should when there's something big going on (explosions, etc.). I'll have to see more movies there before I can give the sound system an "Excellent" rating, but I would say that my first impression was very good. Kudos to the staff that maintains and adjusts the sound equipment in that auditorium! This visit was purposely timed around lunchtime so that I could get a meal before heading into the auditorium. The cheeseburger and fries that I ordered were very good, and the box that it is served in makes it very easy to carry and hold in the theater. I would rate the quality of the burger above most fast food restaurants, which helps to justify the higher cost that one pays. One of the nicest theaters I have been to. I love their Ultra screen, it's worth the added expense. Attended the 6:25pm show of Super 8 on June 16, 2011 in UltraScreen #1. The movie started at 6:37pm after trailers and the policy trailer was played. The sound was quite good. Super 8 has some very quiet moments, but then some very loud moments, and everything sound-related was very good. The picture, however, could use some work. During the policy trailer, I noticed that the image was shifted low on the screen, to the point where the text on the bottom was cutoff by the bottom of the screen. I hoped that it would be corrected by the theater staff, or it was just an issue with the previews that would correct itself, but that didn't happen. Fortunately, it wasn't noticeable to the point of being annoying during the movie, so I wasn't going to miss the movie to bring it to someone's attention. Something so obvious shouldn't have to be brought up by a customer, though, as the theater staff ought to be able to see a problem like that and correct it without being prompted. The second problem with the image was annoying, and that was the reflection of lights in the auditorium on the screen. This caused blacks in the movie to be more of a dark grey, and each side of the screen had a reddish tint that I thought was being caused by the exit lights on the lower level. After the movie, I looked to see if that was the case, but the exit lights are actually green, and farther off to the side than where the reflection was happening. The only thing I can think of that caused the reddish tint was the orange stair strip lighting, as those lights (while small) have a direct line of sight to the screen. The screen looked very reflective, moreso than I remember from the last time I attended the UltraScreen (which was probably Iron Man 2). Even then, I remember thinking that the black levels were way too high, but I attributed that to the house lights being too bright during the show (which I believe they were). This time, the house lights seemed OK, but the reddish glow at the bottom of each corner of the screen was very distracting. For a movie that has a lot of dark scenes, this "grey instead of black" problem diminished my enjoyment of the movie. When you pay $11 to see a movie, you should expect a top-notch presentation. I would say that the UltraScreen #1 at Majestic achieved this with the sound, but was not even close with the picture. They need to work on minimizing reflections on the screen to improve the quality of their presentations. I love the majestic, and the VIP seating is really fun. What I DON'T like is that they don't post the movie times until very late on MONDAY for that FRIDAY's shows. Especially for the day after Thanksgiving, it makes it very hard to plan for what time your movie is playing. I can only guess that the Majestic is losing a lot of business to the Ridge. Poor planning on the management's part. My husband and I love the theater and go on a regular basis. However last night we went to see Paranormal Activites 2 and paid for the Reserve Seating. We paid the extra money for the seat and was satisified. The problem is when the usher left and came back and asked people for their ticket stubs for the reserved seating they did not pay for the seating. She told them to leave the area but did not make sure they left all they did was move down the row. No one ever came back to look over the seating. There several people that came in after the movie started and sat in the reserved seating without their tickets being checked. I feel if a customer pays for the seating and others come in without paying is a little rude and I feel like the place ripped me off the $15 extra dollars I paid. There should be some better control. I am not satisfied and felt like I was taken advantage of. Thank you for time. This theater is really nice. So nice and still new since 2007. But I am baffled as to why such a new facility is not more wheel chair friendly. I have a really good friend I take to the movies who is in a wheelchair, we always need assistance at this theater. The push button exits are a perfect example. They have them, but they don't work. I have to wait for someone to assist. Also, just as general advice to all theaters, people don't leave the handicapped seating for the handicapped. If you see someone arrive in a wheelchair, to a busy full movie theater, please offer them help to find appropriate seating. Most likely they can't get out of the chair to climb the stairs to an open seat. More than half the time we see movies at this theater we have to sit separate because folks that don't need it sit in the handicapped areas. The theater complex is very attractive and well maintained. During the barrage of ads and previews which occur before the feature presentation, the screen image was very unfocused. I called the theater from my cell phone to as that this be rectified, but the problem persisted until the main attraction started. Not a serious problem, but definitely annoying. I also wish that the theater could identify which movies were being played on which screen. I go out to the movies for the BIG Screen experience and would probably choose not to go to one of the smaller screens. This movie theater is near Brookfield, Vernon, Waukesha, Pewaukee, New Berlin, Elm Grove, Milwaukee, Wauwatosa, Butler, Lannon, West Allis.